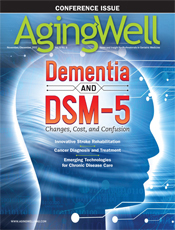 Diagnostic criteria for dementia will be updated in 2013, but embracing the umbrella term “cognitive disorders” is not without controversy. Robotic therapies are effective in helping stroke patients regain function while limiting disability. The national health policy organization NEHI identifies the technologies with the greatest potential to improve care and reduce costs for providers, patients, and payers. Variations in older adults’ health status increase the challenge of accurate cancer diagnoses. The lack of data from elder-specific clinical trials exacerbates the problem. Evaluate patients’ strength, balance, and mobility to determine fall risk and develop exercise therapies to prevent decline. Dry skin may result from aging or signify an underlying condition. Because it can lead to other skin complications, it’s important to monitor carefully. 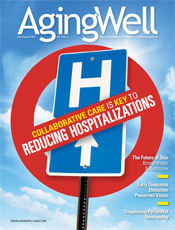 Hospitals and healthcare practitioners must focus on establishing patient-centered, quality-based initiatives that reduce hospital-acquired infections and length of stay. Despite the challenges diagnosing peripheral neuropathy presents, physicians must become more efficient in their patient workups. Geriatricians and primary care physicians can play a key role in detecting glaucoma symptoms and saving patients’ eyesight. 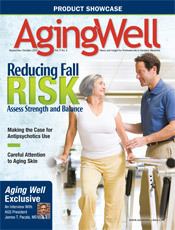 Patients’ quality-of-life enhancements have been shown to create a greater inducement for older adults to exercise. Physicians play an important role in identifying patients’ anxiety disorders and helping them cope with or overcome the anxiety. Patients’ sleep routines and patterns as well as the quality of sleep can negatively impact their daily functioning and quality of life. 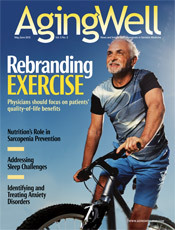 Physicians must be proactive in identifying and treating dysfunctional sleep. 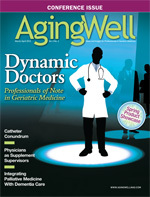 Aging Well features geriatricians whose dedication to patients and commitment to elevating the specialty place them among the 2012 Professionals of Note in Geriatric Medicine. Physicians and hospital staff may need to reevaluate urinary catheterization procedures to reduce infection and other complications stemming from urinary catheterization. Aggressive medical interventions for elders’ acute illness may not only be of limited value but also may be an overall detriment. Physicians must evaluate the supplements older patients may be using for their role in nutritional adequacy and in conjunction with patients’ prescribed medications. Implantable electronic devices such as pacemakers and defibrillators offer lifesaving solutions for patients with heart problems. 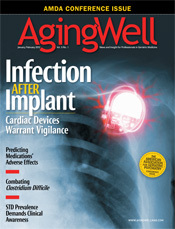 But clinicians must remain vigilant against the possibility of infection following implantation procedures. According to the CDC, 15% of new STD/HIV infections occur in adults over the age of 50. Clinicians must be proactive in discussing patients’ sexual status, improving prevention and education efforts, and developing strategies to treat STDs and HIV/AIDS. More common among hospitalized or institutionalized elders, these bacteria often affect patients with compromised immune systems. Severe cases can result in irreversible colon damage. The prevalence of medication errors demands physicians act more diligently to identify potentially inappropriate medications. The STOPP criteria have been developed and validated to flag inappropriate prescribing.